It seems intuitive that a group policy can offer better value compared to multiple individual policies – and in most cases, this could be true. A simple comparison between policy prices, for example, could easily persuade you to choose in favour of a group policy, even if the margin is only a few dollars. But when it comes to the extent of coverage, you may want to think twice. Here are some situations when you could actually find it beneficial to purchase multiple travel insurance policies over a single group one. When purchasing travel insurance with family cover, it’s important that you know how the policy provider defines “family”. In most cases, family refers to a husband, wife, and their biological or legally adopted children. This means that helpers, grandparents, cousins, and adult siblings are not considered eligible under family cover. Some policies even have a cap on the number of children covered under family cover. When travelling with the elderly as well, there is a higher chance that they will have pre-existing medical conditions – which is not covered under most standard group travel insurance policies. For example, Grandma could have a pre-existing heart condition. If she is covered under a family or group policy, and she has a heart attack while on holiday, she might not be eligible for any medical expenses claims pertaining to her pre-existing condition. Alternatively, if she has her own individual travel policy that covered pre-existing medical conditions, she would have been insured. The cap on the amount insured for group travel insurance policies is usually lower than that of individual travel insurance policies. An example of claim limits for group policies under Insurance Provider A. For a Tier 3 subscriber, the total amount insured under family cover is $15,000 – the same amount as 2 adults at $7,500 each, leaving no room for extra claims under the children. 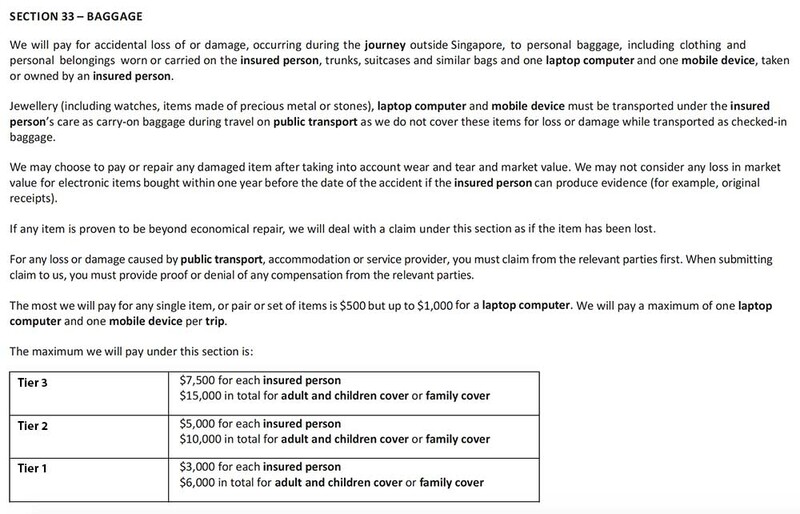 There is also a clause that says there is a maximum claim of one mobile device per trip under family cover. If you’re travelling to a high-risk destination with a higher chance of theft or loss of baggage, it may be worth your while to maximise the total claimable amount by purchasing multiple individual travel policies. Under Insurance Provider B’s Family Plan, for example, there is a limit cap for the total amount claimable. The Family limit is roughly equivalent to the total amount for 2 adults and 1 senior, regardless of the size of the family. 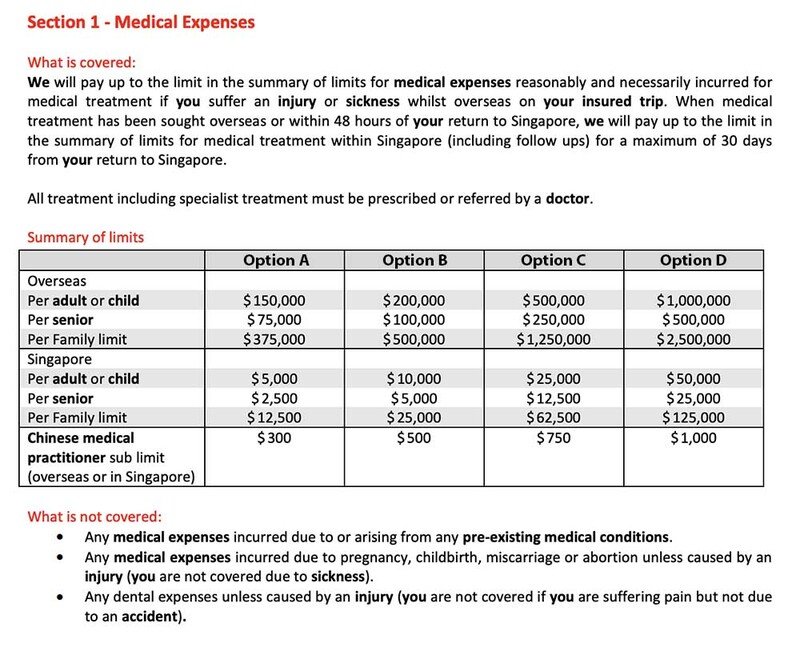 Medical exclusions and claim limits for a Family Plan under Insurance Provider B. The thing about group travel insurance policies is that it provides blanket coverage for everyone under the policy for a fixed number of dates only. This means that departure and arrival dates for everyone in the group must be the same. So if say, a couple wants to extend their trip, or take a detour to another country before meeting up again with the group, they will not be able to do so under the terms of a group policy. In such cases, purchasing individual policies will offer better flexibility, especially when travellers are not too dependent on each other. There can be multiple factors that go into choosing the right travel insurance for your needs. Before purchasing a family or group travel insurance policy, it is important to read the fine print about claim limits. There are also exclusions with regard to what constitutes loss and injury. If the price of a group policy for up to 5 people costs $75, that works out to $15/person. It may be worth topping up a little more to purchase individual policies instead.